My weekend consisted of Ikea, California Closets, Quilting, Wine, Books, Bark Mulch and Power Washing. 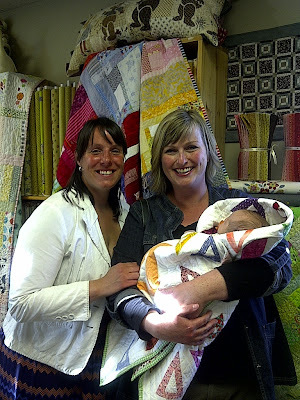 I had the pleasure of attending Cheryl's book launch party at a local quilt shop. Cheryl and I have met several times already and she is as cool as you would think when reading her blog. Trust me. Although, when she comes to my house, I get a little panicky - oh my gosh! Cheryl's coming, what kind of gourmet treats can I make!?! Someone who is a food and quilt blogger...makes amazing recipes, and names her blog Dining Room Empire!? And then, I get all real and serve up grilled cheese sandwiches and vegetable crudites...er chopped raw vegetables. Seriously though. She's cool. And nice. and we get along really well. And you know what !? I got to hold her new Baby Empire! Me and Baby Empire....and Cheryl too. Cheryl makes motherhood and launching a new book seem effortless. I got my newborn baby fix in. Baby Empire slept in one of Cheryl's quilts while she handled the crowds of women fighting over position to get an autograph. But let me just say...I got a special comment in mine. Cheryl had wine, cake pops and donuts, juice and Pellegrino yumminess to share with all of her guests. It was such a nice event! I've been reading it slowly - well, I admit that I leafed quickly through all the photos first, and now am reading it word for word. I LOVE this book. I don't own many quilting books, as you know I enjoy creating my own patterns. 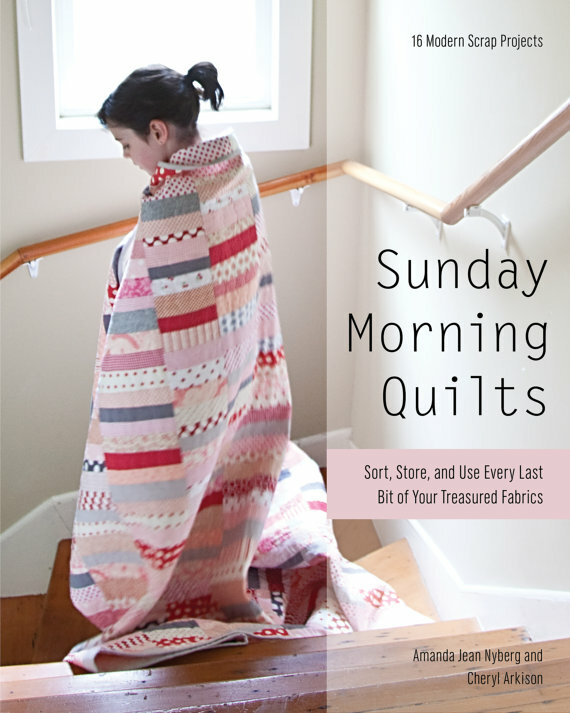 But my favourite part about this book is that it encourages you to make the quilts your own - not follow exact fabric combinations or copy cat quilts. I love the use of scraps in all the patterns, and I've accumulated a lot of scraps. The instructions for sorting and classifying the scraps are really helpful, and I feel like the patterns are a springboard for my own creations....although I will probably make a few of these just as they are demonstrated in the book. So, if you are wondering about this book, it is definitely worth the purchase. Usually I am the library book hoarder and just sign out library books over and over again for inspiration, but this one joins my other two favourite quilting books (Weeks Ringle and Bill Kerr) for inspiration. We want to tackle our basement with some built ins, or at least some cubbies and shelving to organize things a little better for the media area and my sewing area. I love my sewing table, but really, I use about 1/3 of the center, and I think I could probably coolify it up better. So I asked California Closets to come in to quote me for some crafting table and shelving/drawers. ahem. ahem. that's alot of fat quarters. We then went to Ikea instead to get ideas. about 1/10 of the cost. yep. I power washed the house on Mothers Day. I can tell you that a few of the neighbours looked at me like I was a poor soul doing such work on Mothers Day. I need to say it: I love to power wash. It is SO. MUCH.FUN. I love spraying and seeing the dirt fly off and puddle down my siding...only to spray it again and watch more. I love watching the big chunks of dirt fly out of the driveway cracks. SO gratifying. my house is actually nice and neat and tidy with just a smidge of dirt on it. i am not a slob. well. maybe a little sometimes. but it IS a dusty city I live in. Ask me to do the dishes or wash the floor? yuk. Power wash? You betcha! Hope you are all having a fantastic week!! So, related to my post I wrote before, I present to you "Salt Air Crossings", aka red, green, blue and yellow quilt. 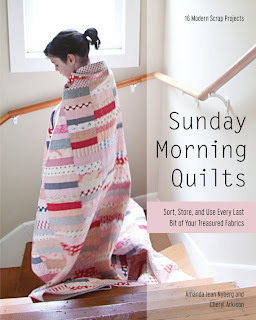 This quilt measures 60x70 and I've posted a tutorial for it on Moda Bake Shop. I machine quilted this using straight line quilting. I washed it up to and it gave it a slightly worn/shabby beach house effect. Fabric used for this quilt - Cosmo Cricket Salt Air by Moda and Bella Solids in Ruby Ice. Jasper has discovered the comforts of home made quilts. How do they know about softness with all that fur? I caught him laying like this after I came up from the sewing dungeon with some clipping scissors.....he was not impressed that I wouldn't let him stay there. Do you twitter or facebook? I facebook...but not very much. I recently signed up for twitter and have followed some people but don't really get it. It seems kind of like facebook? they don't share the bucket of balls very well with me. ME??? I actually signed up for LESSONS! Don't laugh. I'm planning for retirement. Tomorrow! My quilt finish - and its tutorial on the bake shop!